The Sanford Poison Center is designated by the South Dakota Department of Health to provide emergency poison management and poison prevention information to the citizens of the State of South Dakota. The Sanford Poison Center provides all of the education and prevention efforts for the State of South Dakota. The Sanford Poison Center is dedicated to serving the needs of our State and believes that the needs of our residents are best served by a “local” center. However, due to call volume, population base and funding issues it is not possible for us to meet the criteria necessary to be a certified center and handle exposure calls locally. The Sanford Poison Center currently contracts with the Minnesota Poison Control System, located at Hennepin Healthcare in Minneapolis, to handle all poisoning exposure calls. The Minnesota Poison Control System is certified as a Regional Poison Control Center by the American Association of Poison Control Centers (AAPCC). The mission of the Sanford Poison Center is to assure that all South Dakota residents and medical professionals receive accessible, high quality and cost effective human poison information and treatment services. This is achieved through our partnership with a full service regional poison center that provides the needed poison information and treatment guidelines, in addition to our community education aimed at prevention of poisoning exposures and provision or support of other community services. 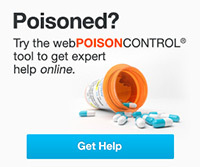 For South Dakota, calls to the national poison control phone number, 1-800-222-1222, are answered by the Minnesota Poison Control System. The substances most typically involved in reported exposures include the following: medications (over-the-counter and prescription), household cleaners and chemicals, as well as cosmetics and personal care products. Members of the Sanford Poison Center’s staff give presentations to health care professionals and the public statewide, display at professional conferences, and present information for media events. Find information about Drug Take-Back Locations, including law enforcement and pharmacy sites.